Does it get any better than bread and butter pudding? 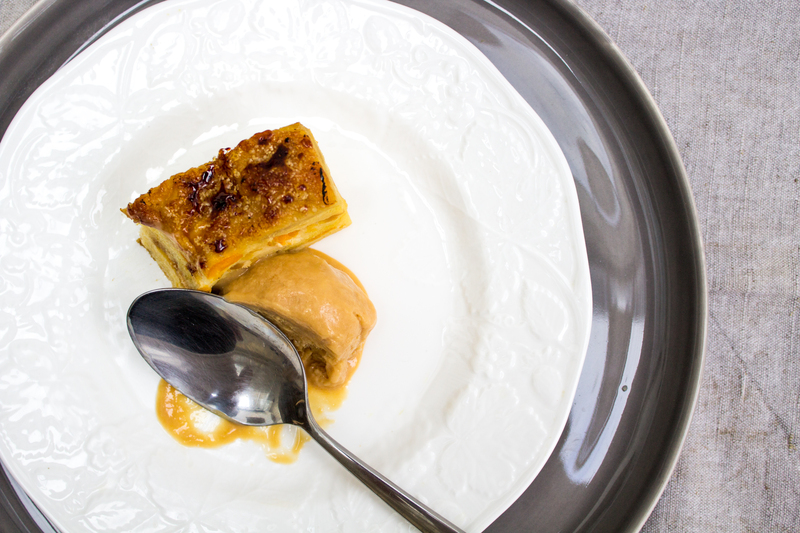 The answer is yes and it’s all about bread and butter pudding with salted caramel ice-cream. So bad, yet so, so good! Mix together all the ice cream ingredients; add to an ice cream maker and churn. Decant to a container and freeze. If you don’t have an ice cream machine, transfer to a plastic container and freeze, every half an hour mix well and return to the freezer until set. Brush the slices of bread with melted butter, arrange in layers, buttered side up, neatly overlapping in a well greased 900g (1.5 litre) loaf tin, scattering the sliced apricots in between the layers. To mix the custard, place eggs, milk and vanilla extract in a large bowl and whisk together by hand until well mixed. Pour over the brioche in the dish and gently press the exposed bread crusts down into the liquid. Sprinkle with the demerara sugar and leave to stand for about 30 minutes. Bake in the oven at 180°C for about 40 minutes until golden on top. Leave to cool, then serve in slices with a scoop of ice cream.